Say 'I love you' by making this edible Rose Kisses Bouquet! All you need is a few simple items to make these easy mini Roses, you don't even need to make a whole bouquet, single red rose looks just as beautiful! 1. Glue two kisses together, bottom to bottom. 2. Paint your toothpicks green, one toothpick for each rose. It's ok to leave one tip unpainted (the tip that you'll stick into the kiss). 3. Cut out some green leaves for your roses and poke a hole with the toothpick and thread the leaf up the stem. You can put one or two leaves on each rose (or more if you choose). 4. Insert the toothpick into the kiss. 5. 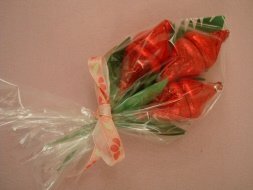 If you are putting your Rose kisses into a baggie (as in the picture), you may want to make a small piece of 'fern' to add to your bouquet. Just cut a triangle out of green construction paper and cut out little slits all around it. 6. Now you're ready to put your bouquet into the baggie. First, put in your piece of 'fern' into the corner of the baggie. Next, place your rose(s) over top. 7. Gather the baggie at the bottom of the leaves and tie a piece of ribbon, yarn or tape, to secure.